Ghee is good for skin and digestion. It also helps in healing wounds. Ghee helps in protection from viruses and bacteria. 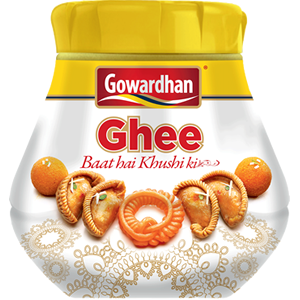 Gowardhan Ghee is produced in a Morden dairy plant, using a time-testing traditional recipe to capture the full flavour and aroma of cow ghee. It is reach source of natural vitamins and B – Carotene. The high level of poly unsaturated acids and low saturated fats in cow ghee makes it a healthy option. No added colour. Store in clean, cool, dry place, free from mosture, humidity, insect, pests, strong odours, sunlight & dust.